Glee creator Ryan Murphy took to Instagram to officially announce that he is in the process of developing the hit Broadway musical comedy The Prom into a feature film for Netflix. The Broadway hit was directed and choreographed by Tony Award winning director Casey Nicholaw (The Book of Mormon, Aladdin). RELATED: American Horror Story Season 9 Title Revealed! Set in Indiana, The Prom follows the story of a group of four down-and-out theater actors who tries to help a teenage girl whose school prom was cancelled when she tried to bring her girlfriend as her prom date. 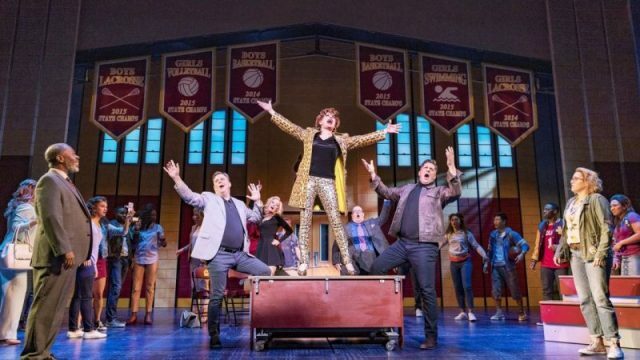 The creative team behind the popular musical is consists of Tony Award nominees Matthew Sklar (The Wedding Singer, Elf the Musical) and Chad Beguelin (Aladdin), whom are the musical’s composer and lyricist, respectively. Tony Award winner Bob Martin (The Drowsy Chaperone) and Beguelin have also written the book based on Jack Vierel’s original concept. The upcoming film will be produced by Bill Damaschke (Shrek the Musical) and Dori Berinstein (One Flew Over The Cuckoo’s Nest). Nicholaw, Sklar, Beguelin and Martin will also be joining Murphy for the film’s creative production. Murphy is no stranger to musical comedy genre as he previously created and produced Fox’s Golden Globe-winning musical series Glee which ran on air for six seasons from 2009-2015. Last year, Murphy has signed a multi-year deal with Netflix to to produce new original content exclusively for the streaming service. The film adaptation will be part of Murphy’s ongoing projects which includes the dark comedy series The Politician and Ratched, a prequel to One Flew Over the Cuckoo’s Nest starring Sarah Paulson (American Horror Story) as a younger version of the cruel Nurse Ratched.